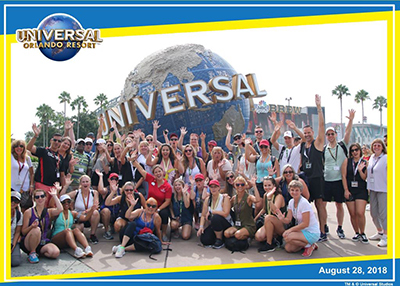 Disney might be ‘the happiest place on earth’, but Kissimmee is where your clients’ ‘happily ever after’ vacation begins. 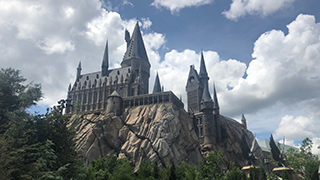 Experience Kissimmee is the official tourism authority for Osceola County, Florida, a little place that welcomes more than 8,000,000 overnight visitors each year. 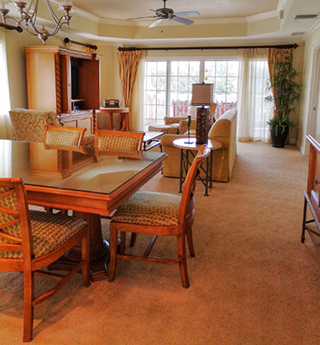 Kissimmee is known as the’ Vacation Home Capital of the World,’ boasting more than 50,000 accommodation options, including luxury resorts, family-friendly hotels, and over 22,000 vacation homes – spacious, fully outfitted homes, many with swimming pools. 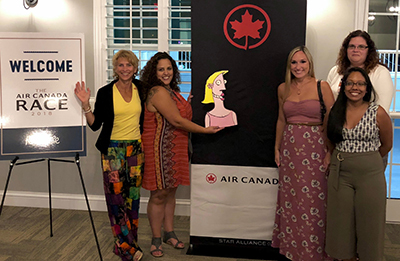 That’s what Experience Kissimmee wanted us to see as this year’s host of the Air Canada Race, in partnership with Air Canada and Air Canada Vacations. The destination invited Tina the Travel Agent and I, along with 30 very excited (non-cardboard) travel agents, AC staff and travel media members to the event based at the beautiful villas of Reunion Resort in Kissimmee. The ‘Amazing Race-style’ experience highlighted the best Kissimmee can offer. The 4-day endurance test encompassed a number of physical challenges in diverse locations. 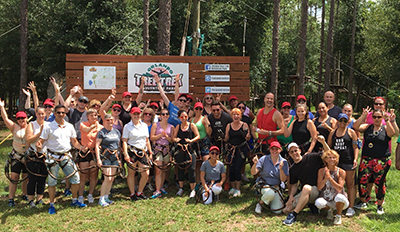 Participants took on obstacles high above ground level at Orlando Tree Trek Adventure Park, played a competitive 18-hole game of Footgolf at one of Reunion Resort’s Signature Golf Courses, and puzzled their way through scavenger hunts at both Universal Orlando Resort and Toy Story Land, the latest addition to Walt Disney World’s Hollywood Studios. 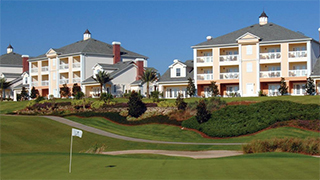 Only 20 minutes away from a very efficient Orlando International Airport, Kissimmee is home to major theme parks, championship golf courses, outdoor adventures, and a wide range of affordable and luxury hotels, resorts and vacation home properties. The tourism authority’s President and CEO DT Minich makes the case that Kissimmee is an ideal place for multi-generational family vacations. With thousands of affordable vacation homes available, families can enjoy a home away from home, with all the amenities of a resort, and a stones-throw away from amazing theme parks. Families can come together to enjoy a day of roller coaster rides and shows, or adults can take in a round of golf or relaxing day at the spa, while the kids enjoy the on-site waterpark. Beyond theme parks, Kissimmee is home to exciting outdoor adventures for all ages and activity levels. Canadians can get a taste of Florida’s unique nature through adventures like a sunrise hot air balloon ride at sunrise, gliding at high speeds across the Everglades in an Air Boat, or an extreme zip-line and treetop trekking adventure. What’s on the horizon for Kissimmee? 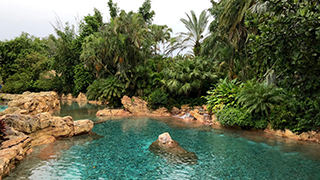 In 2021, Walt Disney World will celebrate its 50th Anniversary, and with a growing number of visitors, Kissimmee is gearing up for the expansion of Margaritaville Resort, with the addition of a 220-room resort and waterpark, along with 1,000 new vacation homes. Team Tina in front of AC banner at the Island Grove Wine Company.